How to Download Android 8.0 Oreo for Snapdragon Note 8 AT&T, T-Mobile, Sprint, Verizon USA variants? Leave a Comment on How to Download Android 8.0 Oreo for Snapdragon Note 8 AT&T, T-Mobile, Sprint, Verizon USA variants? Samsung Galaxy Note 8 becomes the third device to receive the latest official Oreo update from the major South Korean smartphone manufacturer. It comes to the USA Snapdragon Note 8 variants both – locked and unlocked. It is based on the latest March 2018 Android security patches and brings the new Samsung Experience 9.0 based on Android 8.0. With the new SE 9.0, you get all the new user interface from Samsung and also the Oreo goodies such as Picture-in-Picture, advanced app permissions, notifications channels, and much more. So download and install the latest Android 8.0 Oreo OTA or full stock firmware update right now. Following the international Note 8 variants, the Snapdragon Note 8 SM-N950U (carrier) and SM-N950U1 (unlocked) USA variants are receiving the official Oreo OTA update. This comes to the Unlocked, AT&T, Verizon, Sprint, T-Mobile Note 8 CDMA devices. 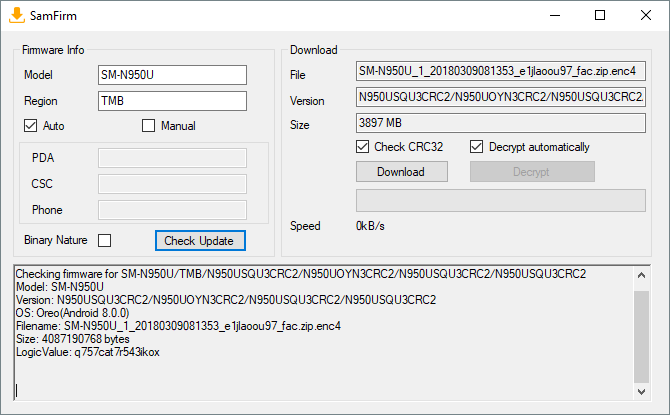 The new Oreo update takes the firmware build number (Baseband version) of the two Snapdragon Note 8 SM-N950U and SM-N950U1 variants to N950USQU3CRC2 and N950U1UEU3CRC1 respectively. According to the S8’s latest update, Android 8.0 Oreo firmware brings a new user interface, better battery life, stability and performance improvements. According to the users of Oreo, SE 9.0 is the best firmware update so far. It also upgrades the Note 8 TouchWiz Launcher version to a newer one for more stability. Other updates are general device stability and bug fixes. 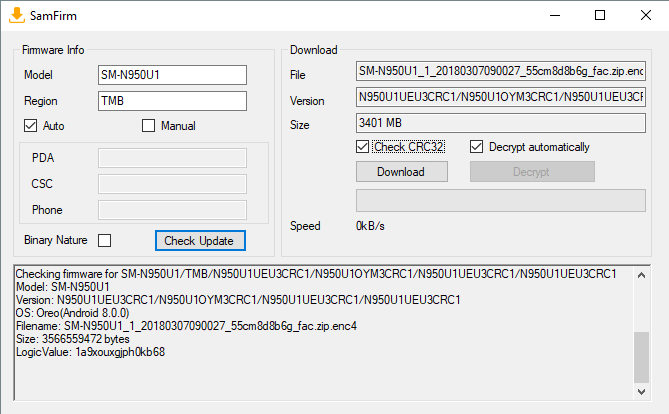 How to download and install official Oreo update onto Snapdragon Note 8? You can download the full stock firmware for Samsung devices using the SamFirm tool. It will let you download firmware updates directly from Samsung servers. This includes without restriction. You can also download the official OTA updates from from here. You can also capture the OTA by selecting your device, putting in the current firmware your device is on, and finally selecting the update you would like to be on. Once you download the OAT update, you can install it using the ADB sideload method or stock recovery method. You can also see: See how to capture OTA update? Download and extract SamFirm tool to PC. Find out the model number for your device under Settings > About Phone > Software information. Find out the CSC code or Product code for your specific region. Run the SamFirm tool and input the model number and CSC code. Download the latest stock firmware for Samsung Galaxy Note 8. Following is the stock firmware for the unlocked Note 8 variant. Finally, head over to this tutorial for installation: How to restore Note 8?